I was prepared to fawn over the Doughnut Plant’s offerings like a hobo waiting for an apple pie to cool on a windowsill, for the next 8 days. That torture today done in under 10 seconds, I combed over today’s specials at the Falchi building. Besides the gluten-free baked goods at Sans (will save for Friday), there wasn’t anything I could or wanted to get there. For instance, Juice Press has a sale (yay), but the items that were available today, I didn’t care for (nay). Will Good Neighbor Queens be a good neighbor to me and the rest of the Passover-observant populace today? Won’t you be my neighbor? It gave me a resounding “maybe”. Con: Today’s soup was Cheese Broccoli. Damn. Also, there were 20+ kinds of crackers, various baked goods and homemade bread on their sandwiches. Triple damn. 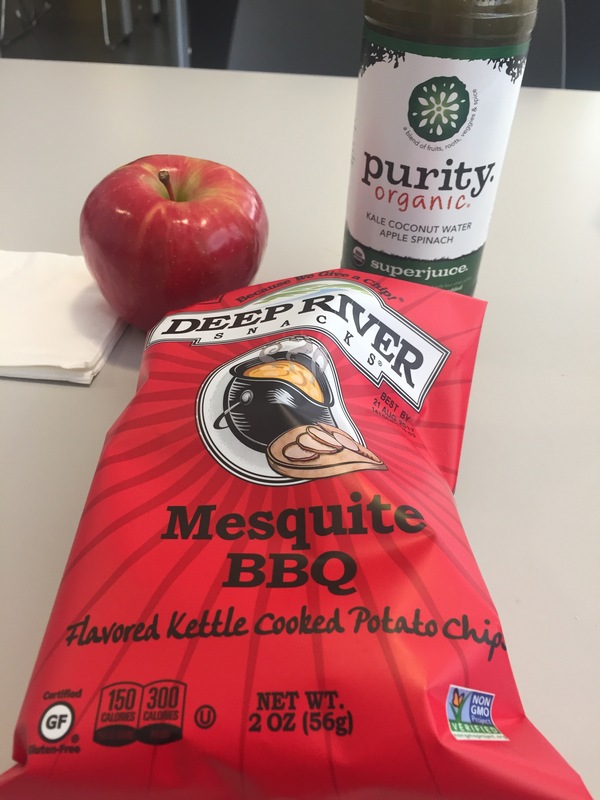 They also had 10+ kinds of Deep River Snacks (potato chips), so I settled on Mesquite BBQ ones. “Down home” goodness from Deep River, CT (Connecticut is considered the “down home” country? Seriously? ), the chips’ spice mix was delightful: brown sugar, onion salt, garlic salt, paprika, etc., conveying the right sweetness and smokiness. The organic Fuji apple was the great dessert of the day: sweet and tart, big and juicy, with a great crunchy fruit and pink flesh.